In view of the very low acceptance rate of the Unified Screening Mechanism (USM), perhaps it is necessary to rethink the purpose of this mechanism. Vision First suggests that at the Legislative Council’s Panel on Security on 7 July 2015, lawmakers re-examine the implementation of the USM and its usefulness to taxpayer who this year will foot a 644 million dollar bill to operate what refugees dubbed a ‘fake’ scheme. Given that the Government bluntly refuses to grant asylum and brands refugees as illegal immigrants, what rational and objectives have supported Hong Kong’s asylum process since 1992? The city’s masterminds are too savvy to operate exclusively on the premise of moral obligations towards the international refugee problem, as states are rarely motivated by moral responsibility alone. 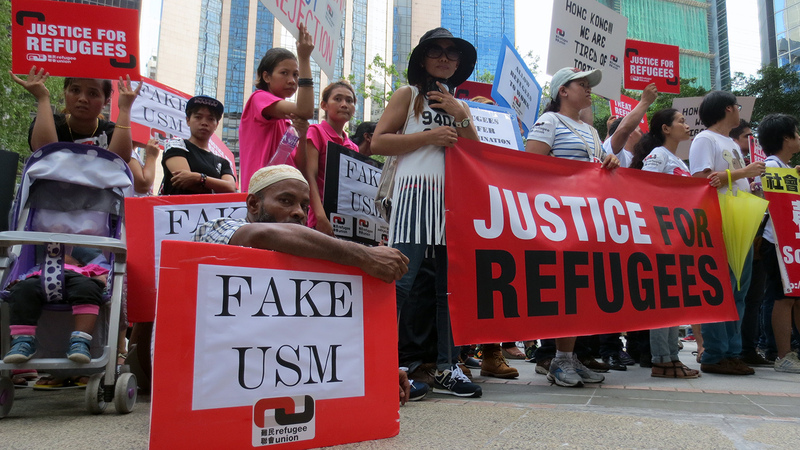 The USM seems to be characterized by its migration control function, rather than the Government’s international duty to safeguard persecuted foreigners. Like its predecessors, the USM does not offer sanctuary. Rather it exerts state power to confine, control and ultimately expel an unwanted migrant population. Government propaganda successfully homogenized refugees with economic migrants, illegal immigrants and travelling outcasts stigmatized as a risk to Hong Kong’s security and affluence. Within this self-serving masterplan, the USM is deployed as a MECHANISM OF BORDER CONTROL to relentlessly banish asylum seekers, stateless persons, failed (often pregnant) domestic workers, economic migrants and other misfits perceived as a nuisance after a few years of exploitation. The Government is less than sincere about even granting non-refoulement protection, or else considerably more than 28 refugees would have been identified and assisted since 1992. Such negligible results indicate that the asylum process has routinely performed the function of rejecting undesirable border-crossers, rather than protecting vulnerable refugees. When will the USM be amended to include assessment of Bill of Right Art. 2 “Right to Life” claims? Why are USM claimants not allowed to work in Hong Kong despite living in destitution? What evidence can the Security Bureau provide that allowing asylum seekers to work would lead to a massive influx of new arrivals into Hong Kong? Why are USM claimants arrested for working illegally and given longer jail sentences compared with visitors and/or overstayers? Some local NGOs claim that the level of welfare assistance given to USM claimants is too low for individuals to subsist, making it necessary for them to work illegally in the city. What’s the Bureau’s response to this claim? Some lawyers confirm that most of their clients do not receive sufficient funds, or financial assistance in kind, or food to meet their basic needs as rents have increased and inflation has outstripped what amounts the SWD provides. This leaves them with no choice but to beg and frequently resort to working illegally. Is it not a fact that the increase in rents has outstripped the rental assistance provided to claimants? Do you agree that thousands of asylum seekers lived for years, and hundreds continue to live, in abandoned chicken and pig farms sanctioned by the government as these were/are the only locations affordable based on government rent assistance? Do you agree that such pig and chicken farms are not zoned for residential living? Is the government investigating why this happened and who is responsible for distributing public money to pay for illegal structures? Will anyone be prosecuted for allowing dozens of refugee slums to develop and operate on funds paid from the public purse between 2006 and 2015?